This has been a truly amazing legacy of giving and it all began with Cyndi Tangren (Anything for a Friend's 8th Recipient) answering the call of a hurting family. The Shaw's had just recently found out that Dylan, their 10-year-old son had a deadly cancer in his brain stem called a DIPG. They were devastated and Cyndi jumped to action with her family and put together a tree full of gift cards and money for Dylan and his family. The Shaw's were so touched by this expression and felt the fresh air of hope for the first time since the diagnosis. Dylan wanted to pass the goodness on to someone else in pain. He met and became quick friends with Tyler Smith (Anything for a Friend's 10th recipient), who had been diagnosed with liver cancer. Dylan knew that he wanted to light up the dark cancer world that Tyler had been thrown into, so he held a bake sale and raised the money to put together a tree for Tyler and his family. It was just what they needed! Tyler, true to his nature wanted to continue the legacy of giving so he and his family quietly went about this and surrounding communities delivering a “Giving Tree” to numerous families in need and without regard to their own pain brought comfort and joy to others. Among the recipients of the "Giving Tree" was Brandon Winger (Anything for a Friend's 13th recipient), who passed it on to Maddie Cook who then passed it on to Josh Harvey. 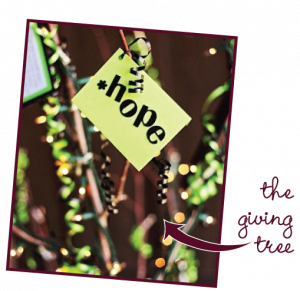 The collective statement of hope, love, and support that embodies the “Giving Trees” is not ending! The Shaw’s, Smith’s, Winger’s and Harvey’s lost their beautiful sons to this deadly disease which most would believe was the end of the “Giving Tree”, but not even 3 months after losing sweet Tyler, the Smith’s put their pain into action. This action is took the form of a dinner and benefit concert in Tyler’s memory in August of 2012. Over $12,000 was generated from this benefit concert and will be put towards helping numerous families through the legacy of the “Giving Tree”. Each tree will bring hope and love to troubled souls and each recipient of the Giving Tree will hear about Tyler's courageous F2TF (Fight to the Finish), which was his battle mantra and have that powerful symbol in their home, helping them to set their own determine to Fight to the Finish! Submit a brief summary of what your friend is going through and why the Giving Tree would be so helpful for this person and their family. In an effort to involve those who love the recipient and make the tree as meaningful as possible, Anything for a Friend/F2TF Team Tyler will match up to $500. The tree will therefore have at least $1,000 worth of cards and cash (and can have much, much more depending on your efforts!). Lastly, for those recipients living from Logan, UT to Provo, UT, Anything for a Friend/F2TF Team Tyler will help you put the tree together. If the recipient is outside of these boundaries, AFAF/F2TF Team Tyler will work with you as you put together the actual tree. Please submit your nominations to either Ann Smith at promconnection@msn.com or Becky Anderson at becky@anythingforafriend.com. Thank you so much for your giving hearts and active hands! Giving Trees currently in the works! Officer Jason Read, age 40, died unexpectedly Tuesday morning at the McKay-Dee Hospital in Ogden, where he’d been receiving treatment since he was hurt in a motorcycle crash Sept. 23rd. Read, a married father of three, joined the Centerville Police Department in 2005. We are heartsick for Jason and his family and are calling on the Anything for a Friend family, Officer Read's Police family, and the community to come out in support of his family that is left behind in this tragedy. There has been a giving tree started with the students and staff of North Layton Jr. High, where Officer Read's wife is a first year teacher. Please join us in putting love into action by doing your ANYTHING! If you would like to give words of encouragement to The Giving Tree, please do so below! Home Depot--Trees for all of the Giving Trees!